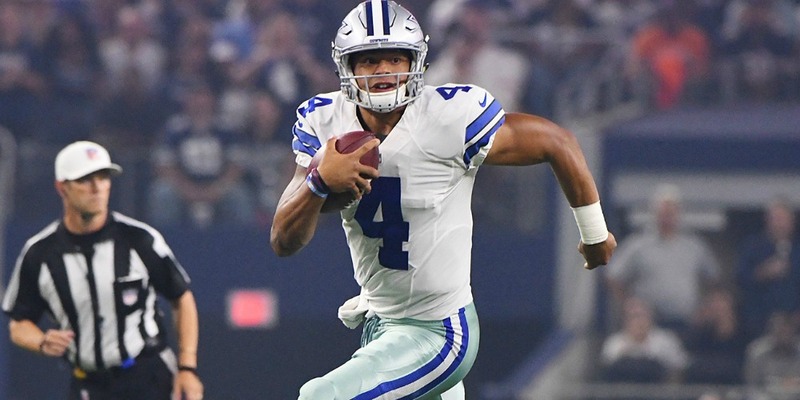 Two teams seemingly heading in operate directions square off on Sunday when the Jacksonville Jaguars travel to Texas to take on the Dallas Cowboys. Jacksonville finds themselves tied for first in the AFC South division while the Cowboys are tied for second at 2-3. These two teams have not faced each other since November of 2014 when the Cowboys won in Jacksonville, 31-17. The Jaguars had won the prior two contests to that and the all-time series is tied, 3-3. The Jacksonville Jaguars were looking to knock the only undefeated team from their perch on Sunday, but an early onslaught by the Kansas City Chiefs doomed Jacksonville as the Chiefs dominated 30-14. Despite the loss, quarterback Blake Bortles had a career game, throwing for 430 yards on 61 attempts. However, he was sacked five times and threw four interceptions. Kansas City led 23-0 before Jacksonville would even get on the scoreboard. Three Harrison Butker field goals and a rushing touchdown by quarterback Patrick Mahomes accounted for 16 of those points. However, the big blow was a 20-yard interception return for a touchdown by Chris Jones with less than two minutes to go in the half that really doomed the Jaguars. Jacksonville would look a lot better in the second half. Bortles threw a 14-yard touchdown to T.J. Yelton to get the Jaguars on the scoreboard with 3:10 left in the third quarter. He would add a 21-yard touchdown run with a little under six minutes left in the game to complete the scoring. Jacksonville comes into the contest averaging 20.4 points per game, but they have a top-five defense, only allowing 17.2 points per contest. The Jaguars are averaging 404.6 yards of total offense per game while giving up the fewest yards in the NFL at 292.2. Jacksonville is allowing only 191 passing yards per game on average. The Houston Texans won the battle of Texas on Sunday, thanks to four field goals from Ka’imi Fairbairn in the 16-13 victory. Each quarterback had a touchdown pass, as Houston QB DeShaun Watson threw for 375 yards. Dallas would jump out to a six-point lead on two field goals by Brett Maher in the first quarter. Houston would take the lead when Watson connected with Keke Coutee for a 1-yard score and would extend their lead to four just before the half on a Fairbairn 20 yard field goal. After the break, Cowboys QB Dak Prescott move the team down the field, connecting with Allen Hurns for a 3-yard touchdown to put Dallas back on top by three. The Texans would respond with a field-goal and each team would add three points in the fourth quarter, sending the game to overtime. Neither team could score on their first possession of overtime, but Houston would finally end the contest with 1:50 left in the extra frame when their kicker connected on a 36-yard field goal attempt to give the Texans a 16-13 victory. Prescott threw for 208 yards and a touchdown. He was intercepted twice and sacked twice. Ezekiel Elliot gained 54 yards rushing on 20 carries. Dallas is averaging only 16.6 points per game but is allowing just 19.2 points per contest. They are averaging 307.8 yards while giving up 337.4. Their run defense has been spectacular, allowing 95.8 yards per contest. 6-1 ATS in their last seven games on field turf. 8-2 ATS in their last 10 games following an ATS loss. 5-2 ATS in their last seven games overall. 2-5 ATS in their last seven games in October. 5-0 ATS in their last five games in Week 6. 7-2 ATS in their last nine games in October. 1-7 ATS in their last eight games at home when facing a team with a winning record on the road. This should be an outstanding defensive battle as these are two of the top five defenses in the National Football League. Jacksonville enters this contest as a favorite, which shows the confidence that oddsmakers have and how well this team has performed over the last season and a half. However, Dallas is still extremely tough at home, and they do have better weapons in the contest. That’s why we like the Cowboys. There is no doubt that points are going to be at a premium in this game. Even at a total of 40.5, we think that’s a little high.